Dr. Sandra Moore is committed to your health and wellness! She received her Bachelors Degree of Science in Mortuary Science at Wayne State University in 1997. She served her community as a funeral director for 17 years. During this time, she developed an important relationship with her own chiropractor, who saw a spark in Dr. Sandra and encouraged her to consider chiropractic as a career herself. With the birth of her first son, Dr. Sandra was inspired and took a fresh look at the possibility of a new way to serve the community and a new way of life. 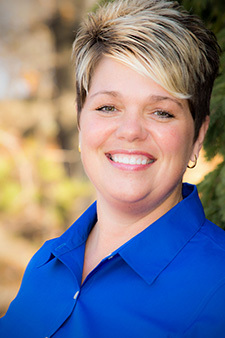 With the support of her husband Rick, Dr. Sandra and family moved to Iowa where she received her Doctorate in Chiropractic at Palmer College of Chiropractic in Davenport. Your healing goes beyond temporary pain relief. Dr. Sandra has a special interest in pregnancy and pediatrics so she can help kids get a healthy start. She is certified by the International Chiropractic Pediatric Association in the field of pediatric chiropractic care. “Continuing education is essential to serving my community,” says Dr. Sandra. She is a member of the Palmer President’s Club, the International Chiropractic Pediatric Association, The Michigan Association of Chiropractors and the Michigan Chiropractic Pediatric Association. Her belief in family wellness has inspired Dr. Sandra to volunteer with the Rocket City movement supporting Reeths-Puffer Schools. Rocket City has one goal, the success of Muskegon youth: Your body, Your Health, and Your Choice. Just as Dr. Sandra is dedicated to her patients, she is just as committed to her family. Dr. Sandra has been married to husband Rick, for over 20 years. They have enjoyed creating a healthy childhood and happy memories for their children Mitchell and Allison. Adding even more love to their household are their miniature Husky, and two cats. Dr. Sandra enjoys volunteering her time with local schools and is a member of the Women’s Division Chamber of Commerce.